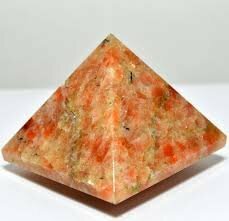 Jet Natural Sunstone Pyramid Approx. 1.25 - 1.5" Approx. Earth Elements Jet International Crystal Therapy Booklet A++ Best Seller Worldwide. Kindly note that since all our products are handcrafted, there always exists slight deviations in size, shape, color of the products compared to image shown here. However, the Healing Qualities & Metaphysical Properties are EXCELLENT. Sunstone is linked to luck and good fortune. It clears and energises all the chakras. Sunstone instills good nature, heightens intuition and allows the real self to shine through happily. It dissipates fearfulness, alleviates stress and increases vitality. These Gemstone Pyramids are 100% genuine and hand-cut to precision by gemstone craftsmen in Gujarat, India. These Pyramids are specially hand crafted and Energized for the purpose of manifestation and each worker making them knows that each piece is not a mere show piece. This power, is said to preserve foods, maintain the sharpness of razor blades, improve health function, trigger sexual urges and cause other dramatic effects.